Magnolia West took on the Bryan Vikings and as everyone well knows Bryan has kicked West out of the playoffs two years in a row and the Mustangs finally got their revenge winning 31-14 and move to 3-0 in their record. The defense played well and the offense took a huge step from last week. In particular, the offensive line looked solid and the QB, sophomore John Matocha, looked very good. “You know we made it the emphasis this coming week. After last week- kinda struggled a little bit- we put a lot of focus on execution and being disciplined. We did some other things [tonight] that they hadn’t seen, so we are just adding, installing an offense still. We did a lot better tonight,” Coach Berna said. The offense did look much better scoring 31 points in the game. 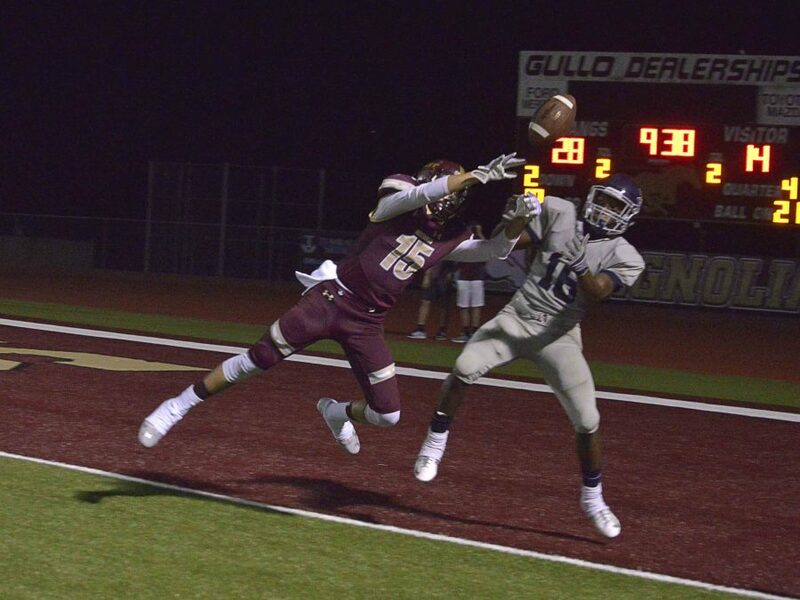 The running game wasn’t as great as the week playing Navasota, but the passing game looked stellar. Senior RB Jerry McGrew scored 4 times: a 16 yard TD run, a pair of 3 yard TD run, and a 1-yard dive into the end zone. Sophomore QB John Matocha had a beautiful TD pass on a roll out to senior FB Austin Melo who caught and ran for about 6 yards for the TD. The offense did have multiple penalties with 8 total. “Yes it’s too many, but to be honest with you, we play aggressive, physical style of football. Sometimes it doesn’t go your way but it is something we have to correct and get fixed,” Coach said. But the penalties aside the Offensive line was spectacular. They gave Matocha all day long to throw, and when no one was open he had open lanes to rush for big gains. Thanks in large part to the blocking of the line, Matocha had 45 rushing yards in the game. The passing game was much improved from the Navasota game, with many balls being thrown on point, on time, and on target. “We focused on it this week. Getting ready for district, opening up with Brenham- they are a really good football team- so we gotta start clicking on all cylinders offensively,” Coach said. Matocha had all day in the throwing pocket which enabled him to have many deep, short, and intermediate passes. He connected on about 60% of his passes. “You know Bryan is a good football team. They got some really big guys up front. They also have some big running backs that are hard to bring down. We just gotta keep executing and you know tackle them,” Berna said. The pass-run and pass defense, in general, was flying around as usual, but the Mustangs had quite a few sacks and lots of QB pressures on the Viking offense. The issue to be corrected was the run defense which allowed big yardage throughout the game and allowed the only two Bryan TDs in the game. “They got a really good football team. Coach Rodgers does an awesome job. He has been coaching for a long time. It feels good for our guys. The last two season, everybody knows, Bryan has knocked them out. This just is a special night and I’m happy for our guys,” Said Coach Berna on his feeling of beating this team. West is a team that came into the season with low expectations, yet with great coaching and their hard work have now moved to 3-0 and are riding high into the season looking like they are a serious playoff threat.